"Can I format SD card for GoPro Hero 5 since I cannot set loop video?" It is a great solution to fix GoPro camera issues by formatting the SD cards whenever you encounter SD ERR or other problems. This article walks you through the whole process for how to format SD card for GoPro Hero 5 Black, Hero5 Session, Hero4 Sesson and Hero Session. Step 1. Remove the SD card from the GoPro camera and insert it to Mac or Windows SD card slot, or you can also use a USB cable to connect the GoPro camera with your Mac or Windows PC. Step 2. When the GoPro camera SD card appear as an external hard drive on computer, you can right-click (command-click) on it, select "Format". Confirm the action and it is done and done. Format SD Card in Hero5 Black: keep your SD card inserted in GoPro Hero5 Black and turn on it. Open the menu on the back screen with the side button > go to Preferences and scroll down > select "Format SD Card" option and tap it > select "Delete". Format SD card in GoPro Hero5 Session/Hero4 Session/Hero Session: please note that you can’t format SD cards in these cameras directly by using the camera option. To format the SD card, you need to have the official Capture app installed on your phone first > connect your GoPro camera with the capture app by using wifi > go to the "Settings" > scroll down and select "Delete All Files from SD Card" in the Delete section. Format S card in Hero4 Back and Hero4 Silver: Go to "Settings" and scroll down > click the trash icon and confirm the action. Important!!! You might have noticed that while formatting GoPro Hero SD card, all files on the SD card are deleted completely. To avoid precious video and picture lost, you need to transfer them from SD card to your computer for backup beforehand. 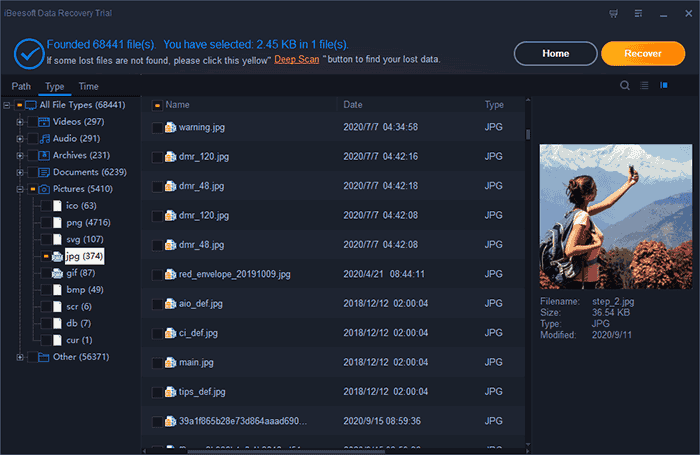 If you have videos and pictured lost while format the SD card, there is still a chance for you to get them back, but you need to do it as soon as possible. Otherwise, they will disappear permanently. Here are the simple steps for how to recover videos and photos from formatted GoPro SD card. iBeesoft Data Recovery is a great powerful data recovery tool. 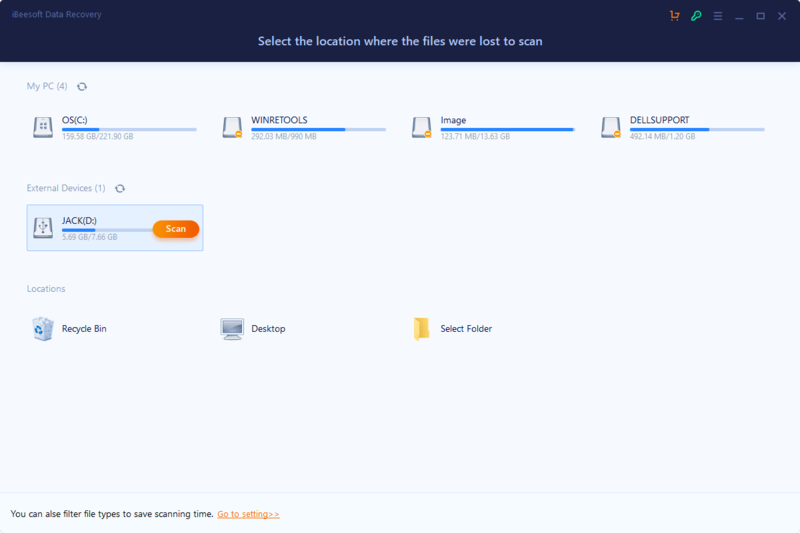 It is developed for people to recover all kinds of lost data from computer and all types of SD cards, USB flash drives, and external hard drives. It is fully compatible with GoPro Hero SD card. Feel free to install it on your computer. It has the separate version for Mac data recovery and Windows data recovery. You can use a USB cable to connect your GoPro camera with the computer directly or remove the SD card from GoPro camera and insert it to the SD card slot on Mac directly. It is up to you. When connect successfully, you can see it appears on your computer as an external hard drive. Launch iBeesoft Data Recovery. All supported files are selected in the main window, you need to uncheck the unwanted ones, only keeping Videos and Pictures selected. Click "Start". In the next step, please select GoPro SD card and click "Scan". After then, you can see the software begin to scan the SD card for deleted videos and pictures. When it finishes the scanning process, you can see all found files are listed in the result window. Filter out the wanted ones by selecting file type and file extension. Next, select files to preview and click "Recover" to save them to your computer.